Love dessert but don't want to eat something sugary? 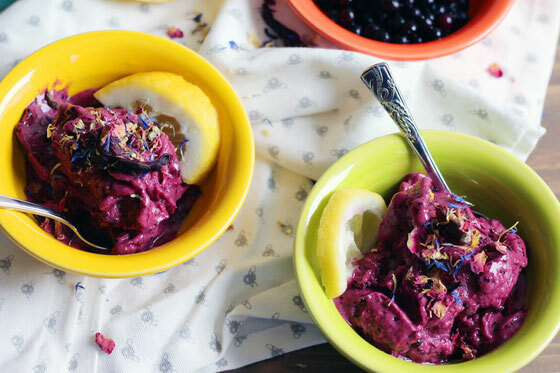 Here's a fruit-based ice cream (aka nice cream) that's full of antioxidants, vitamins, and minerals. You're sure to love it, especially the pretty edible flower topping! I have a big sweet tooth, so I'm always looking for healthier ways to get my dessert. I'm a big fan of nice creams, "ice creams" made from fruit and no added sugar. I've played around with many varieties, such as chocolate banana nice cream and cantaloupe nice cream, and I recently set out to create a delicious wild blueberry version in a beautiful ultra violet hue. The Pantone 2018 color of the year just so happens to be ultra violet! According to Pantone, ultra violet "communicates originality, ingenuity, and visionary thinking that points us toward the future." I can't wait for you to try this forward-thinking, brilliantly hued, delicious dessert! To make the nice cream, I combined frozen bananas with frozen wild blueberries, lemon zest, and lemon juice in a food processor. After the mixture was nice and smooth, I added it to a bowl (you can also use a sugar cone) and topped it with a lemon wedge and edible flowers. The flower mixture I used combines rose, hibiscus, marigold, and cornflower—but you can use any dried edible flower that you like! I chose wild blueberries for this recipe because they're a naturally sweet food filled with health-helping antioxidants—in fact, they contain more than double the antioxidants of cultivated blueberries! Wild blueberries are also an excellent source of cholesterol-helping fiber and may benefit your heart health as well as lower your risk of cancer. Floral ingredients are big this year, which is why I decided to add the dried flowers as a topping. They're slightly crunchy, just like sprinkles, but aren't filled with sugar! This recipe is great for a casual night at home or a fancy dinner party. If you're whipping it up just for yourself (like I did the other night! ), you can freeze extra portions. I hope you enjoy this nice cream as much as I do. It's easy to make and pretty to look at! Want more ultra violet recipes? Try my Vegan Wild Blueberry Cauliflower Smoothie and my Wild Blueberry Peanut Butter Smoothie. 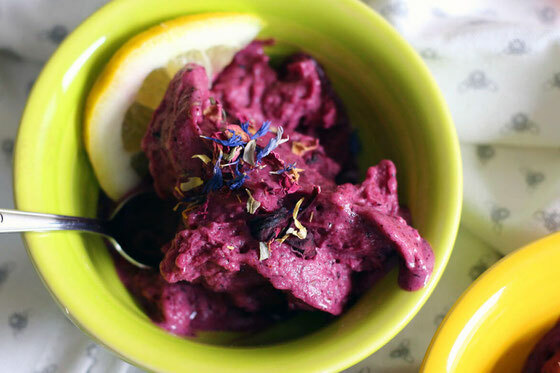 Combine bananas, wild blueberries, lemon zest, and lemon juice together in a food processor. Process for 1-2 minutes, until smooth. Place in bowls, garnishing each serving with a lemon slice and 2 teaspoons dried flower petals. 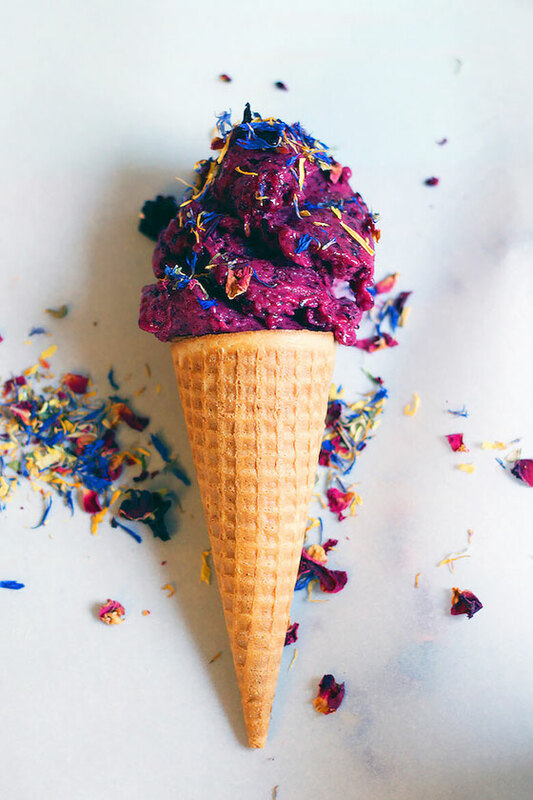 Or place each serving in a sugar cone, garnishing with 2 teaspoons dried flower petals. Serve immediately. Makes 3 servings. **Nutritional information is without the sugar cone. What are your thoughts on this topic? What are your favorite nice cream ingredients and toppings?